* Please note that we are not able to provide tech support by phone or through skype. If you need help with one of our products, visit our support area. Zik Software respects your right to online privacy. We do not collect personal information while you visit our website, or while you use any of our software products. When you purchase one of our products, any personal information you give us is kept strictly confidential and is used only to process your order. Your email address and other personal information will never be sold or otherwise disclosed to any third party. Also, we do not send unsolicited bulk email of any kind. Zik Software is a small and independent software studio based in Turin, Italy. Our goal is to design and develop amazingly usable, rock-solid software for our clients and us. We focus mainly on Mac and cross-platform desktop solutions as well as on mobile apps for iOS and Android devices. Although I often use the plural when I talk about it, Zik Software is actually Angelo Scicolone, a 34 years old software developer with a Master's degree in Computer Science who has been writing applications for about 25 years (yep, you did the math right). Angelo Scicolone was born on the 31th of July, 1983 in Gela, Italy. Developing software for personal computers has always been his passion. He started as a self-taught when he was 9 years old and that passion eventually became his profession through hard studying and plenty of working experiences collected over time. Starting 2000, he designed, developed and marketed many different applications for the Mac OS and the Mac OS X operating systems under the “Zik Software” pseudonym, obtaining highly positive reviews from various international magazines like MacWorld, MacUser, MacAddict, MacLIFE, Applicando and others. In 2001 he started a ten years long collaboration with Applicando, the #1 Italian Macintosh magazine published by Il Sole 24 Ore Business Media, for which he wrote several technical tutorials and reviews. In 2002 he won the REALbasic Cubie Award, an international prize for the best applications made with REALbasic, for the development of PrefsOverload, which was rated first in the "Best Utility" category. The same year he moved to Torino and started Emerasoft, a software company specialized in desktop publishing systems. The company's premiere product, called LPS, was mostly developed by himself. In 2005, with the arrival of new associates, Emerasoft S.r.l. became a limited company and extended its market as a third party software distributor also. Since that moment he was Vice President for Research & Development for a year, after which he quit the company. During the almost 4 years of work in Emerasoft, he collected many experiences as enterprise level developer and system integrator, working for big italian and foreign companies like SEAT Pagine Gialle S.p.A. and Polarion Software GmbH. In 2006 he earned a Bachelor’s degree in Computer Science from University of Turin, with a thesis about Grid Computing which included the full development of an install CD-ROM to easily create or expand a computational grid based on PBS Professional and SLAX (Linux) operating system. Since 2007, he has been involved mainly with custom software design and development as a freelance, focusing on desktop publishing, digital publishing, graphics and photography apps as well as scalable and distributed client/server publishing systems solutions. 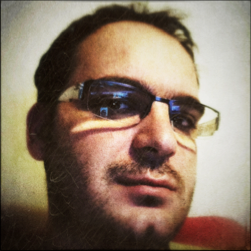 In 2011 he earned a Master's degree in Computer Science from Univerisity of Turin: his thesis covered SprintPress, a distributed publishing system based on Adobe InDesign, Mac OS X Server and MySQL, completely designed and developed by himself for a sports newspaper. In 2012, after years of work “behind the scenes”, he went back to publish his own software: Deadlines Pro, his first iPhone/iPad App published on the App Store, has been quite successful, especially on the Italian App Store, where it reached position #5 of Top Paid Productivity Apps Charts and position #38 of All Top Paid Apps Charts. In February 2013, he co-founds PubCoder, a start-up that aims to create a software platform to enable authors, publishers and illustrators to easily create and publish highly interactive multi-language eBooks for every mobile or desktop device, either in EPUB3 or as native apps. His role here is leading the development of the desktop authoring application, which is the heart of the platform.